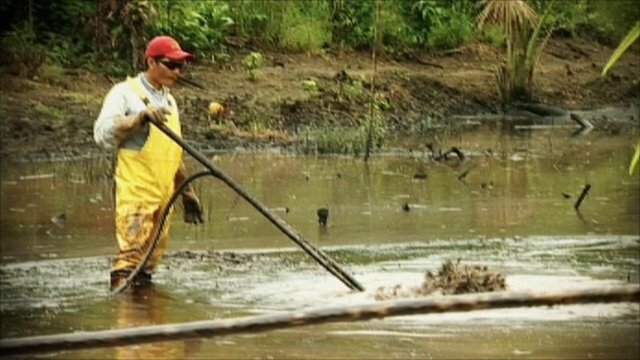 Children 'used in Peru oil leak clean-up' Jump to media player The BBC has seen first hand how children are being used to help clean up a huge oil leak in the Peruvian Amazon. The state owned oil company denies using child labour to help contain it. Protests over Ecuador oil drilling Jump to media player Protests in Quito as the president of Ecuador, Rafael Correa, announces that he is authorising oil exploration in a pristine part of the Amazon rainforest. Oil threat to Ecuador's rainforest Jump to media player Ecuador - the fifth largest oil explorer in the world - is now seeking foreign donations in exchange for a promise not to exploit the reserves that lie under the Huaorani land. The BBC has seen first hand how children are being used to help clean up a huge oil leak in the Peruvian Amazon. More than 3,000 barrels of crude oil has leaked from a pipeline in the jungle and a state of emergency has been declared. The state-owned oil company denies using child labour to help contain it.